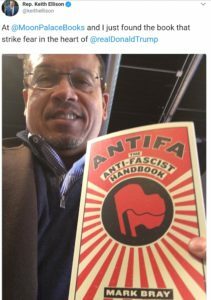 In 2008, Ellison accepted $13,350 from the Muslim American Society (MAS) to go on a pilgrimage to Mecca. The Muslim American Society is a Muslim Brotherhood organization: “In recent years, the U.S. Brotherhood operated under the name Muslim American Society, according to documents and interviews. One of the nation’s major Islamic groups, it was incorporated in Illinois in 1993 after a contentious debate among Brotherhood members.” That’s from the Chicago Tribune in 2004, in an article that is now carried on the Muslim Brotherhood’s English-language website, Ikhwanweb.